We partner with the MidWest Food Bank and receive individual donations to provide food baskets each month for a limited number of families in our area. To donate or serve, please contact the Coordinator, Phyllis Fulkerson. 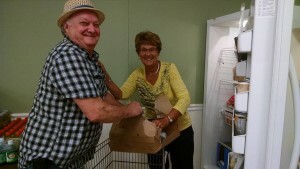 To apply for a food basket, please contact the church office at (309) 691-2096. As we feed the hungry, we serve Christ. In the Idioms Class, we discuss some of the odd American phrases that don’t really translate well. (“Get a move on!” “Rubbing salt in the wound,” and “Scared stiff.”) We also have a group meeting to study English as a Second Language, discussing some of the very basic words or thoughts that one might hear in normal daily activities. And, if there is an interest, we will have a simple Conversations Class where you can talk and listen… as we also talk and listen… hopefully helping you to be more at ease in your conversations in English. An important part of our meetings is just getting acquainted with each other and our different cultures, and building relationships. Weekly sessions begin September 14th at 7 pm and run through the Spring, with a break over the holiday season. Other opportunities are also available. In more than 1,000 classes in 39 countries, people of all ages, races and cultures participate in BSF, whether they are discovering God’s Word for the first time or have studied the Bible over a lifetime. BSF Women meet at Woodland at 6:45pm on Mondays. For more information about BSF at Woodland, click here. For more information about CBS at Woodland, click here. Playing sports should be fun for kids, and the Christian Center helps make that happen. They emphasize character and integrity, and kids learn about prayer and discipleship as well as the game. 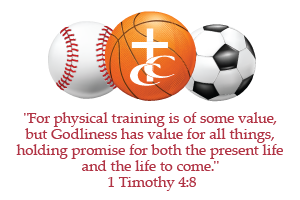 Sports include basketball, soccer, and baseball for kids K through 12th grade. Contact the Christian Center by phone at (309) 685-4218 for more information. We host a summer camp experiences for children including both day-camping through Camp of Champions USA and away-camp through local and state opportunities. We’re confident that these camps provide an environment for our children to have a great time while learning more about Christ and themselves. Make this your kid’s best summer ever.